There is a lot of activity in this simple request for 8K. What is all the communication? Frankly at this point, I’m not sure. I haven’t looked at the contents of the packets but I’d guess some of it has to do with getting file attributes. Maybe we’ll go into those details in future postings. For now what I’m interested in is throughput and latency and for the latency, figuring out where the time is being spent. I most interested in latency. I’m interested in what happens to a query’s response time when it reads I/O off of NFS as opposed to the same disks without NFS. 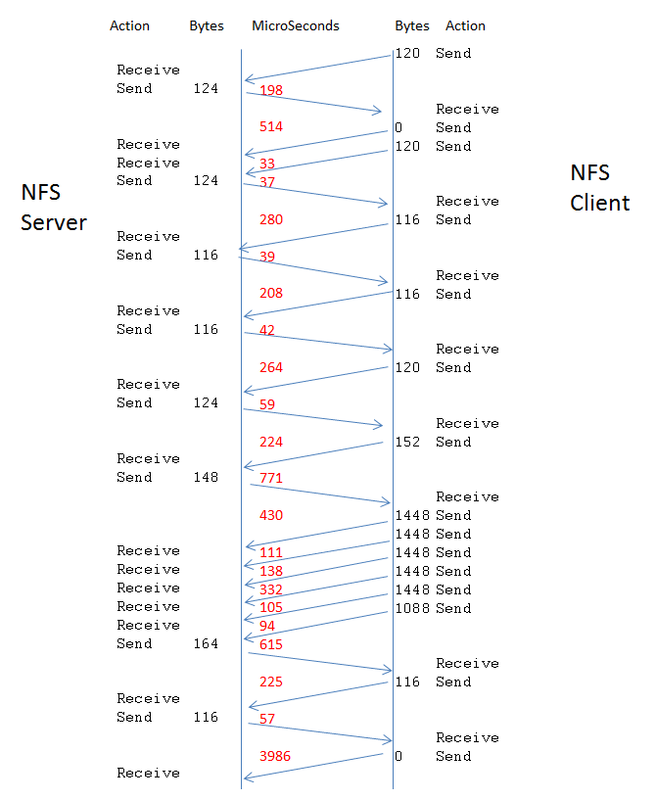 Most NFS blogs seem to address throughput. Before we jump into the actually network stack and OS operations latencies, let’s look at the physics of the data transfer. Well if I look at the above diagram, the total transfer time takes 4776 us ( or 4.7ms) from start to finish, but this transfer does a lot of set up. The actual 8K transfer (5 x 1448 byte packets plus the 1088 byte packet ) takes 780 us or about twice as long as optimal. I don’t have an answer to the following TCP performance difference between two machines, but thought I’d post about what I’ve seen as I think it’s interesting, and maybe someone else has ideas. I’m running netio (http://freshmeat.net/projects/netio/) on one machine (opensolaris) and contacting two different Linux machines (both on 2.6.18-128.el5 ), machine A and machine B. On the opensolaris machine I used dtrace to trace the connections. From dtrace, all the interactions TCP settings look the same – same windows sizes on the receive and send, same ssthresh, same congestion window sizes, but the slow machine is sending an ACK for every 2 or 3 receives whereas the fast machine is sending an ACK every 12 receives. All three machines are on the same switch. So the fact that it looked like the slow machine was acknowledging every second or third send was due to the fact that the receiver was already behind on acknowledging previous packets. Now the question remains is why did the receiver get so far behind on one machine and not the other. Not quite sure why this was happening but by a process of elimination I found that accessing args in tcp:::receive caused these errors. Fortunately many of the values in args are found in args as well. The ack=rack seems solid as tcps_rack = “highest sequence number for which we have received and sent an acknowledgement”. What the heck is that huge time 4789720 us? ie 4 secs? The whole operation took me less than 1 second. what we see is the data ordered by CPU. In other words for each CPU the data is ordered but which CPU get’s printed first is unknown. In dtrace each CPU buffers up it’s data and then sends it to the userland dtrace process. The only “fix” for now is to add a timestamp and order the data by timestamp. so now the strange long time delta is at the beginning where I’d expect it. I’m not quite sure how to deal with this. Post processing the data by sorting the timestamp column works, but interactively processing the data to get it in the right order as it comes out seems problematic. Jumbo frames can have a significant impact in latency, though jumbo frames are often difficult. Implementing jumbo frames on a machine can cause the machine network communications to hang if a machine or switch on that connection doesn’t support jumbo frames. Modifying switches to support jumbo frames generally requires taking the switch offline which may not be feasible. Below is a comparison between standard MTU of 1500 bytes and jumbo frame MTU of 9000. IN n this case the jumbo frame connection is twice as fast. I think using throughput divided by the blocksize as a base target for measure of latency is fraught with danger. Throughput is measured simply as how fast a certain amount of data goes from A to B. It omits all the other “niceties” of TCP/IP, of which the MTU is one of the most relevant. When we are dealing with 1KB/10us potential timeframes, things like the speed at which the actual controller hardware can acknowledge and follow-up each and every one of the MTU blocks becomes very relevant. 10us is right up there with CPU cycle speed in network card controllers (no, they are not intel core i7s…)and it takes quite a few of those cycles to process each MTU before attending to the next. The influence of largeframe (larger MTU) networking configs cannot be overstated here. If the purpose is to transfer large amounts of data, then a larger frame makes for less interference of MTU process time within overall time. Whereas in pure latency terms (fastest possible response to small amount of transmitted data) a standard MTU is far more desirable. Conflicting requirements! Let’s not forget that the whole purpose of the choice of a 1400 MTU as the default size harks back to a time in the IT past when block sizes of 512 bytes were “huge”! Far outscaled nowadays, but seldom if ever changed. More or less the same inferences here as the modern trend to disk sector block sizes of 4K instead of 512 bytes – a size that is a leftover from the very first days of SCSI technology and totally out of proportion to current data and disk sizes. Also the same reasoning behind using hugepages to avoid TLA thrashing for virtual memory paging. Thanks for a very thought-provoking post, much appreciated. Thanks for stopping by. Yes, jumbo frames can make a big difference. After you posted your comment I added an example of with and without jumbo frames to show how the communication changes and how much it impacted latency. In the particular case jumbo frames was twice as fast. Indeed. Thanks for the update. However, a word of caution with jumbo frames. I unfortunately got hit by this last year when we were setting our db servers into separate vlans, with firewalls in-between. Not all routers, bridges and firewalls can operate properly when jumbo frames are used. A lot have diminished functionality. And things like CNAMEs and such become notoriously harder to get right. Networking is still in the embryo stages with flexible frame sizing and there are a lot of “hidden features” (if you catch my drift) when one steps outside plain vanilla MTU setups. Far from saying “do not use them”, though. Simply cautioning that it may cause unexpected sidetracks.